Today's blog post was written by Arturo, who is kicking off a blog series for grooms-to-be! He's going to be covering how to add some extra touches to your style and wedding day attire as a groom so you can really WOW your partner on the big day. There is plenty of wedding advice for brides out there, but we definitely felt that grooms were lacking some attention when it came to wedding planning. Having been a groom not too long ago, Arturo learned a lot from his experiences, which he's eager to share with you! Before you know it, your wedding day will be here. Have you thought about what style you want to bring to your wedding day? Now is the time to showcase your sense of style and personalize your look. Your future spouse will appreciate it and so will you! First, we will start off at the core of your look: the suit! Not just any suit but your suit. While some men choose to wear a tuxedo on their wedding day, others choose to customize their look a bit with a suit instead. This is a great investment not only for your wedding day but for many occasions afterward as well. 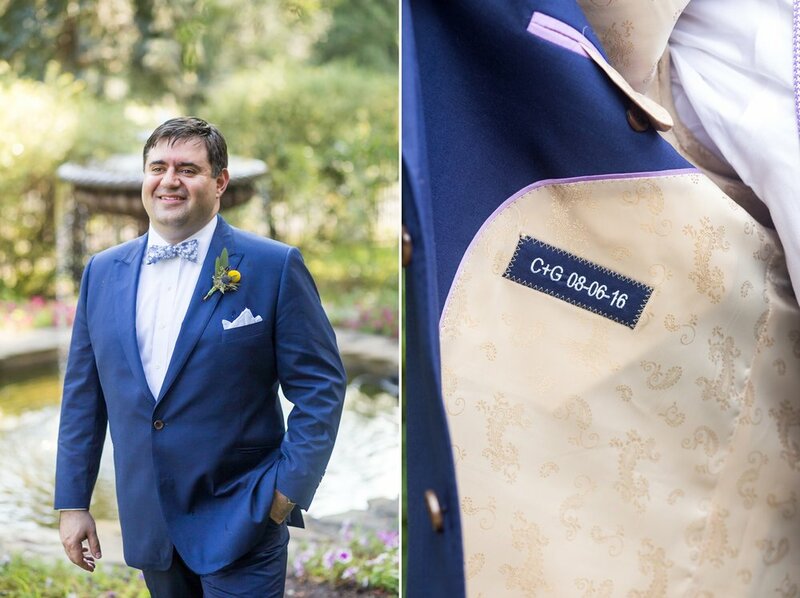 One change of a shirt here and a pair of shoes there, your suit will be able to accommodate many occasions (but for the purpose of this blog post, we will focus on the wedding)! I want to start off by reviewing the fit of a suit. You want to look and feel your absolute best! When you look at wedding photos years after your day has ended, you will thank yourself for making this a priority! Take a look at the Real Men Wear Suits Visual Suit Fit Guide. It's a wonderful educational tool showing how a suit should (and shouldn't!) fit. My friend, this alone is a valuable resource, so do your partner a favor and swear by this! There are many ways to customize a suit such as color, style, stitching and embroidering. Make sure the color (of both the suit and the stitching) is one you really like. Let's talk about George’s suit in the picture above. He selected a wonderful royal blue suit that he had custom made. As you can see, it fits him like a glove! Inside he had the first initials of his bride and himself stitched, along with their wedding date. Moving on to another accessory: the bow tie! This compliments George's suit not only in color, but also in style. This classic, hand tied look truly brings this suit together. I don't know about you, but Shaina and I are HUGE fans of Modern Family, so when we found out Jessie Tyler Ferguson (who plays Mitchell on the show) had a bow tie line with The Tie Bar, we were psyched! His sense of style and color options are amazing. Bow ties will add an extra ‘POP’ to any suit! Ah yes, the cufflinks! These are a very subtle detail, which when noticed, really shows the thought you put into your look! 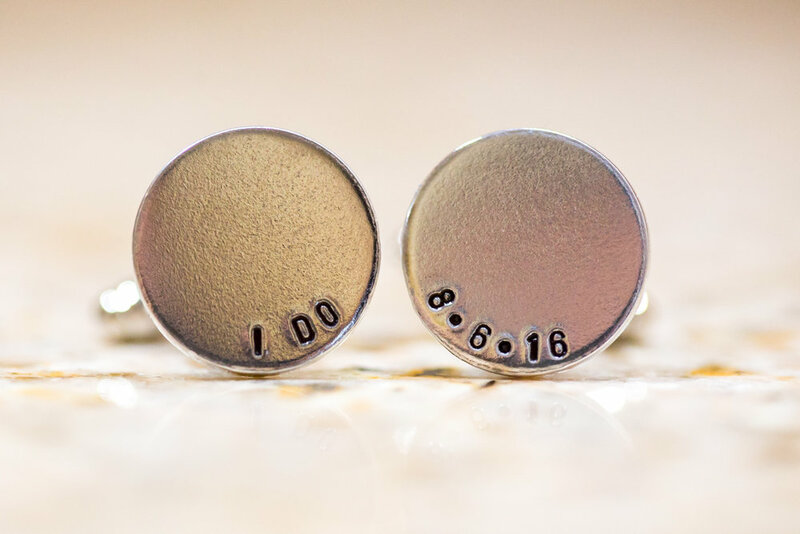 Pictured above are a set with George and Christina's wedding date on one link and the words ‘I Do’ engraved on the other. Though this may seem very simple, think about the memories you'll have whenever you glance at those cufflinks! You do have the option to go all out and have custom cufflinks made that represent something you are known for; a guitar if you are a musician, an anchor if you sail or almost anything else you can think of! Take a look at CustomMade.com for more cufflink inspiration. Lastly, we move on to the shoes. Shoes do make a man, and on your wedding day you'll really want to be THE man! One of the most important things to me (other than style) is comfort! There's no sense in suffering on your big day just for the sake of looks. You need to take into consideration what kind of style is going to match your suit. Classic black shoes are the go to shoe for almost any suit! They also help elevate your style and appearance. To take your style up a notch more, navy blue suits with brown shoes make for a fun option. Search for ideas on Pinterest for an infinite amount of shoe inspiration for your big day! Shine those shoes! It's all about the details! If you purchased the shoes, make sure to wear them a few days before the wedding around the house to break them in. Remember, it's all about the comfort! If you and your partner are planning to do a first dance, get your shoes early so you can rehearse in them. Trust me, I know this one all too well from my own experience! In the time leading up to our big day, Shaina and I enjoyed working together to plan the wedding, which is why we felt many engaged couples would enjoy a male perspective. I know I could have covered plenty of other topics today such as cologne, hats, belts and more, but I'll save those for another post. I look forward to sharing more of my groom knowledge with you in the future! If you liked this post, don't miss the full recap of Christina & George's stylish Hudson Valley Wedding at FEAST Caterers at Round Hill!